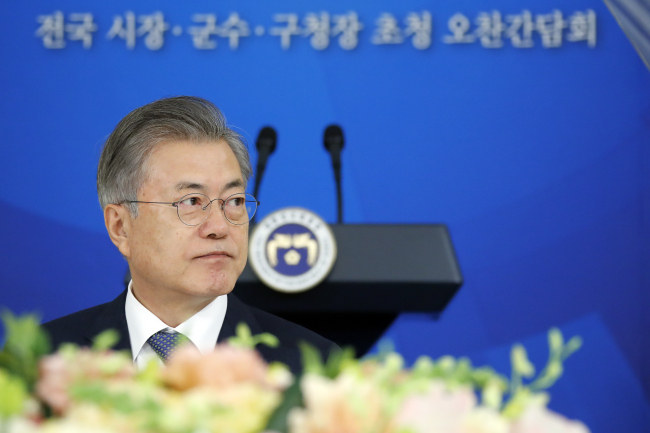 President Moon Jae-in reaffirmed his pledge to give more power, including additional money, to local governments Friday, urging the local governments to do more to create new jobs and boost the economy in return. "For us to succeed in building the innovative, inclusive nation the government is pushing for, we need to have well-off districts more than anything," the president said while meeting with the heads of local district governments. The special meeting, held at the presidential office Cheong Wa Dae in Seoul, was attended by the heads of 215 out of the total 226 county and district governments in the country, according to Cheong Wa Dae. Friday's meeting marks the first of its kind since Moon took office in May 2017, and it follows a series of meetings aimed at promoting investment and job creation. The president has met with a wide range of economic leaders, ranging from the heads of the largest conglomerates to small shop owners, to ask for their support in revitalizing Asia's fourth-largest economy, whose growth is projected to slow to 2.6 percent from a 2.7 percent on-year expansion in 2018. "The government is emphasizing the need to revitalize local economies. I hope government efforts to develop local economies will help the heads of local governments," the president told the meeting. The government will spend 24.1 trillion won ($21.4 billion) this year to help develop region-tailored industries and social infrastructure for different regions, especially rural areas, Moon noted. The government will also seek to transfer more power, including more taxation rights, to local governments, he said. The Moon Jae-in government earlier sought to amend the Constitution, which if enacted, would give local governments far more autonomy. The government-proposed constitutional amendment was never put to a vote due to strong objections from opposition parties. Moon said the government will soon submit a revision to the law on local governments that seeks to enhance and expand the autonomy of local governments. "Also, the government plans for the decentralization of finances were announced last year. The government will implement those steps without fail to improve the ratio of national tax to local tax to 7 to 3 before the end of my term and build the foundation to move toward a ratio of 6 to 4," he said. In return, the president asked the local governments to create more jobs. "Local economies can revive when local autonomous bodies create new jobs on their own and ease regulations," Moon said.